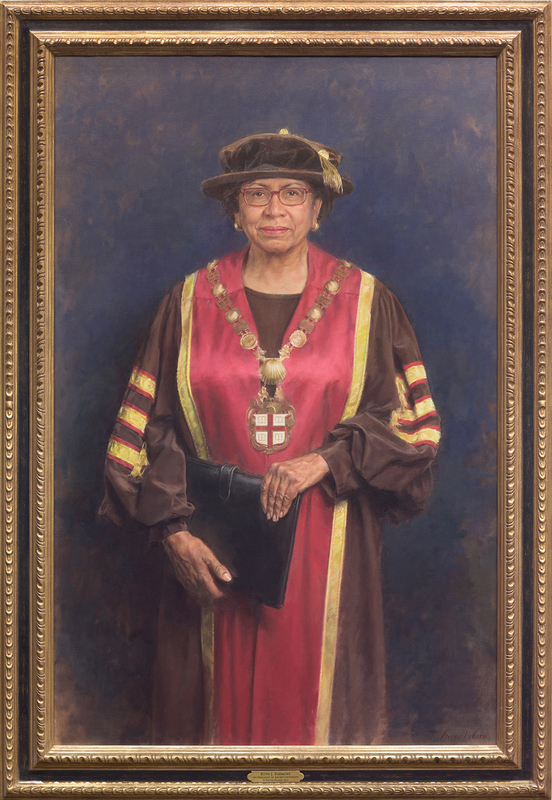 A portrait of Ruth J. Simmons, Brown’s 18th president, has been completed and hung in Sayles Hall. The painting, by renowned portraitist Steven Polson, joins the University’s collection of 317 portraits of presidents, chancellors, deans, faculty, and benefactors commissioned throughout Brown's 250-year history. Thirty-five of those portraits currently hang in Sayles Hall. PROVIDENCE, R.I. [Brown University] — The 35 portraits that line the walls of Sayles Hall serve as a visual representation of much of Brown’s history. This week, the portrait of Brown’s 18th president, Ruth J. Simmons, took its rightful place in that historic company when it was hung Wednesday on the building’s south wall. The portrait, done in oil on canvas by New York-based portrait artist Steven Polson, depicts Simmons standing and wearing the gown, beefeater hat, gold chain and pendant that make up the President’s academic regalia, a pose and garb chosen by Simmons. “I am proud to be represented alongside so many Brown leaders whose vision and selfless efforts shaped the extraordinary University that we know today,” Simmons said. Steven Polson’s 2015 portrait of President Simmons was installed in Sayles Hall on Wednesday, Jan. 20, 2016. The painting enters the University’s collection of 317 portraits that includes many figures from Brown’s history, including administrators, faculty, graduates, benefactors, and trustees. It hangs next to the portrait of Stephen Robert, Brown’s 19th chancellor, who was in office when Simmons began her work at Brown in 2001. Simmons was named Brown’s 18th president in November 2000 and began her service to the University July 1, 2001. She concluded her presidency at the end of the 2011-12 academic year. Brown President Christina Paxson will host Simmons at a reception during her next campus visit to recognize the installation of her portrait. The University has made it a custom to commission a portrait of University presidents upon their retirement, according to Robert Emlen, the University curator. “This collection is a visual record of the history of the University, but we also commission and collect these portraits in order to honor the people who have built and led the University. That is a very distinguished tradition that we maintain,” Emlen said. Creation of Simmons’ portrait began almost a year ago, when she selected Polson, a renowned portraitist who has painted many well-known figures including Condoleeza Rice and Colin Powell, former U.S. secretaries of state; John Snow, a former U.S. secretary of the Treasury; and several university presidents and CEOs. “Polson is among the top rank of portrait painters working in the United States in this generation, and that was apparent to President Simmons. She liked the quality of his work,” Emlen said. Once Polson was selected, Simmons traveled to his New York studio to sit for photographs and to discuss what the final portrait should look like. Polson included Simmons throughout the painting process, sending her images of the portrait in various stages so that she could offer input. The final portrait, with Simmons’ approval, was completed last fall. Polson said that getting to know his subjects before he paints them is an important factor in being able to portray them accurately. Sitting down with Simmons for the initial meeting in New York and hearing about her time at Brown, he knew he wanted the portrait to capture her commitment to the University and her work in academia. “There was a seriousness and conviction about her, and she takes learning and her job as president very seriously. That’s what I kept in mind while I was painting. It was important to her, and it definitely affected the outcome of the portrait,” Polson said.